Valentine is all set to help you wish a “Happy Valentine’s Day” to your heart’s delight. He is all red, in honor of Valentine's Day, and carries a pink heart with the sentiment “Luv U” embroidered on it. And he is wearing a happy smile to boot! This adorable octopus is hand-crocheted, made with 100% acrylic yarn. He is stuffed with polyester fiberfill, and stands about 3 inches (7 ½ cm) tall, not including his spiky hairdo. When sitting, he is about 6 inches (15 ¼ cm) wide from tentacle to tentacle. His eyes and mouth are embroidered with yarn, making him child-friendly. The heart he carries is made from plastic canvas, and is stitched with pink acrylic yarn. 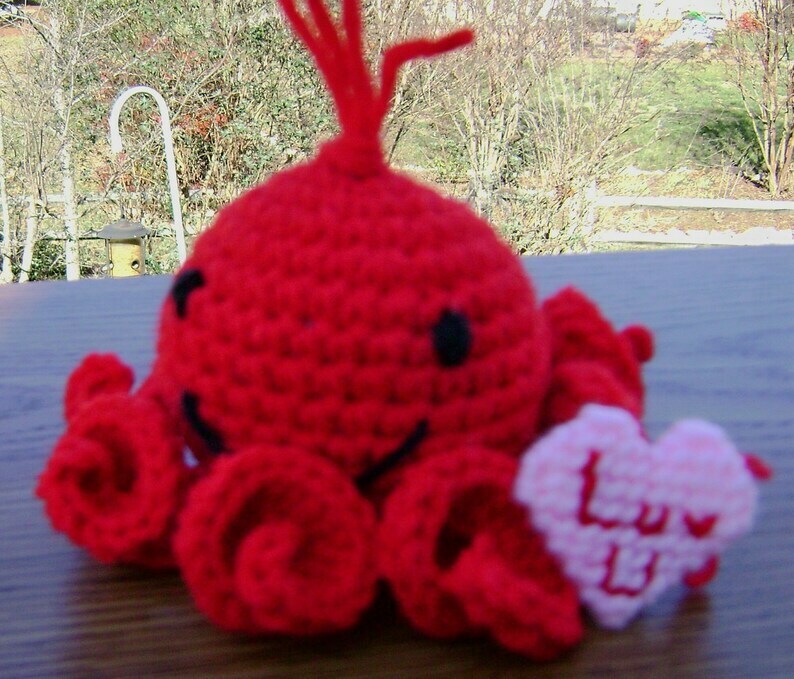 The heart is tied onto his tentacle, and can easily be removed. Valentine was hand crocheted by me in a smoke free, dog loving home, using a design by Sue of HappyWhosits. Care instructions: machine wash, gentle cycle in a hosiery bag or pillowcase with mild detergent. Machine dry on low, or allow to air dry. The heart can be spot cleaned, if necessary. Do not put it in the washer or dryer. Shipping: Valentine will be shipped via USPS First Class Mail with delivery confirmation. International customers, including Canada, will receive their octopus via USPS International First Class Mail (delivery confirmation where available). Please see the Shipping & Policies tab for shipping costs. Any duties or customs fees are the responsibility of the purchaser. I combine shipping to get you the best rate for multiple items purchased at the same time.